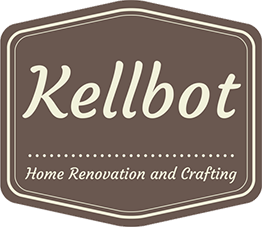 It turns out you can wash pillows - Kellbot! | Kellbot! I was browsing Pinterest for work (yes that is an actual thing) and saw a pin on how to whiten your pillows. It links to a “magic whitening formula,” most of which is probably just OH MY GOD DID EVERYONE ELSE KNOW PILLOWS WERE WASHABLE? Somewhat skeptical, I went to the Closet of Old Gross Pillows (aka the guest closet) and read the tags. Lo and behold, they all say they’re machine washable. By George, I’ll try it! Since I have a high efficiency front loader, the recipe in the article won’t work for me. But with a little improvising I came up with something that worked really well. For the love of god, defer to the instructions on your machine if you decide to try this. I use a very low-suds detergent, and did not have any issues in my machine, but please use common sense and err on the side of caution. My machine has a pretty good soak setting, but for the grosser pillows I stopped it during the rinse cycle and ran them through again. Then I chucked them in the dryer. Martha says to make some felted dryer balls to fluff them up, but aint nobody got time for that. They dried just fine on their own. So how’d they come out? When I pulled them out of the dryer I thought “meh, they still look kinda dingy.” And then I set them down next to the ones that hadn’t been washed yet. 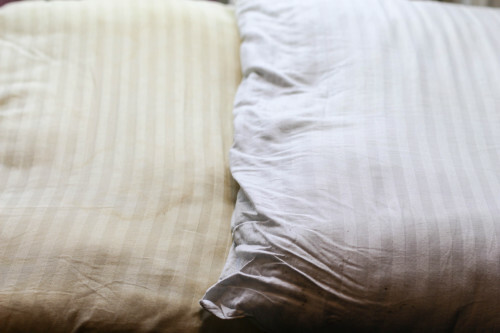 Prior to washing, the left and right pillows were the same color. Gross! I think most of the credit goes to simply washing the pillows, rather than the “magic” whitening solution, but I’m happy either way. Hysterical.Who else could write a post about freaking washing pillows and actually make it entertaining?Pretty much no one. If anyone is constantly surprised by the mundane, it’s me.